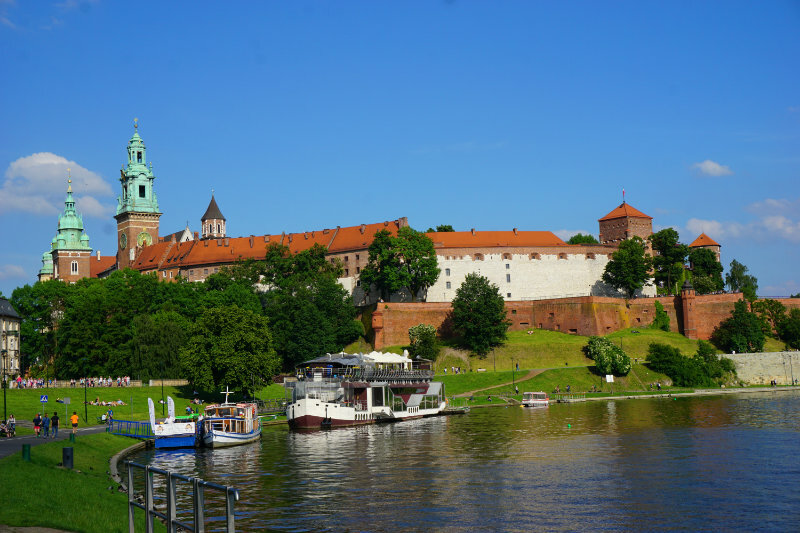 Those who visit Krakow are magically drawn towards it: The Wawel Hill and the castle grounds. It is here where the history of Krakow becomes tangible for those who come with some time. It is the centre of power for the region that sits above the Vistula in Krakow. According to myth, Krak, the founder of the city, already resided on the Wawel. It is also here where the cave of the horrendous dragon that terrorised the citizens is supposed to be. The first buildings on the Wawel are supposedly older than the Polish state and date back to the 9th century. 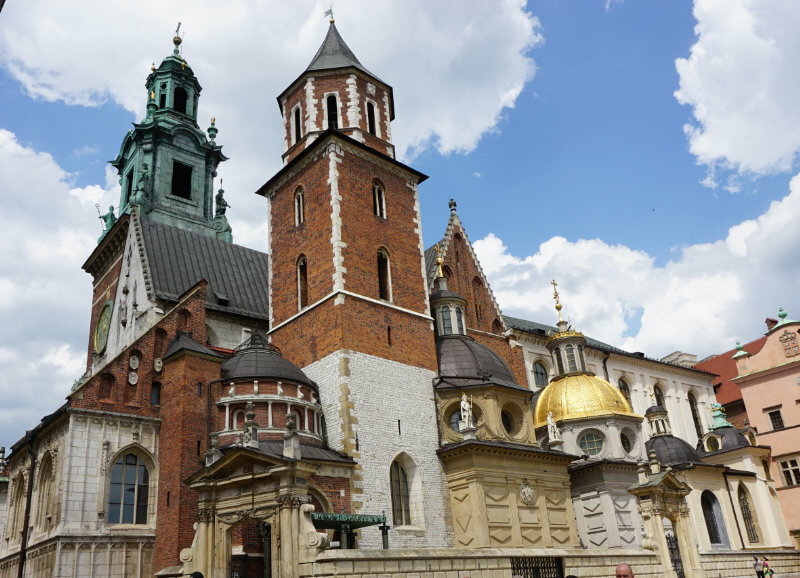 When Krakow became part of the territory of the Piast dynasty the Wawel became the centre of power for dukes and bishops. Around the foundation of the Bishopric Krakow in the year 1000 the cathedral was built. For many centuries the different rulers resided on the hill and expanded their seats. The three towers - the Sandomierz Tower, the Senator Tower and the Tower of Thieves - were erected in the 16th century and are still preserved today. In the 17th century, the king moved his seat to Warsaw and the slow decay of the castle complex began. The 3rd separation of Poland saw Krakow become a part of Austria. The complex was now used as a military hospital and barracks. Unfortunately, the troops destroyed parts of the fortress and the medieval settlement. Poland’s efforts to reach special protection for the Wawel were successful in 1897 and an extensive restoration program began. 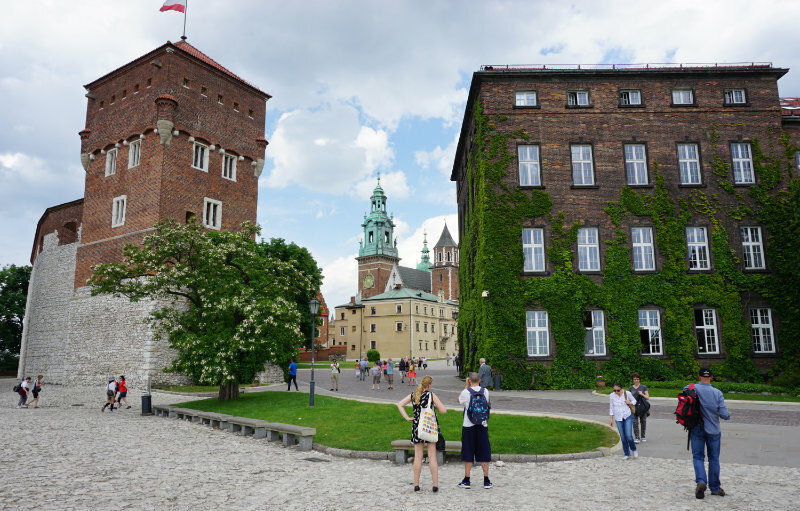 The restoration works were continued after Poland’s independence to be able to use the Wawel Castle Complex as a representative residence of the head of state. 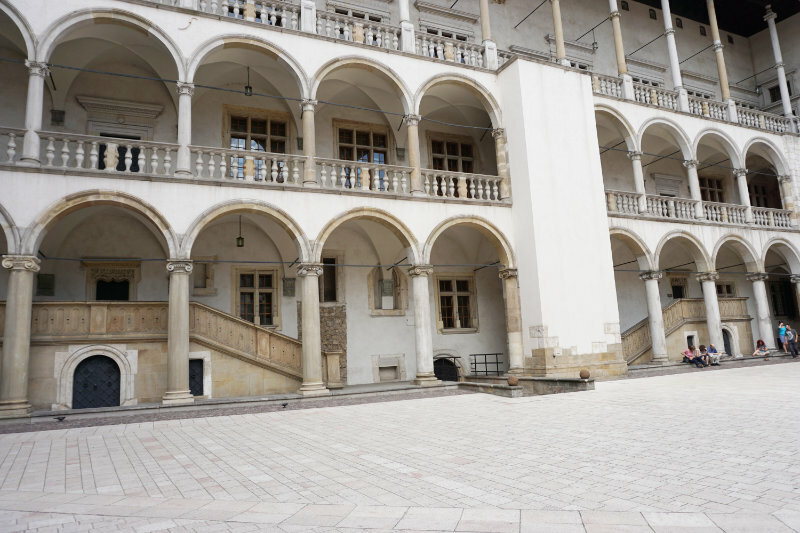 During German occupation of the Wawel in World War II, the interior was exposed to looting and theft, but fortunately, no significant harm was done to the building. After the war the castle complex became a museum. We arrived beneath the Wawel Hill, coming from the riverside walk along the Vistula. 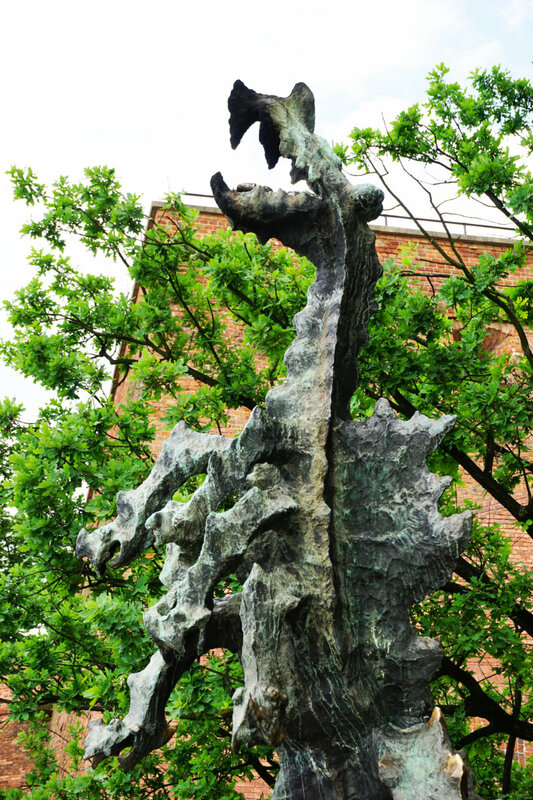 Groups of kids stood around the dragon sculpture, waiting impatiently for his next fiery breath. The dragon automatically breathes fire every few minutes and the visitors love it. In between his fiery breaths, some of the braver folk climbs the dragon for a good picture. It is almost a piece of good fortune to get a picture of the dragon sculpture without a dragon conqueror on top of it. By the way, if you pay to send an SMS the dragon exhales an additional fiery breath. Or you simply wait for the next. A wide path led us from the embankment of the Vistula up to the castle. The view down to the river is wonderful. It is easy to understand why the castle was built here. Enemies can be easily spotted from afar. We enter the courtyard, which is surrounded by thick walls. Here, too, groups of children can be seen waiting to get into the museum or the cathedral. 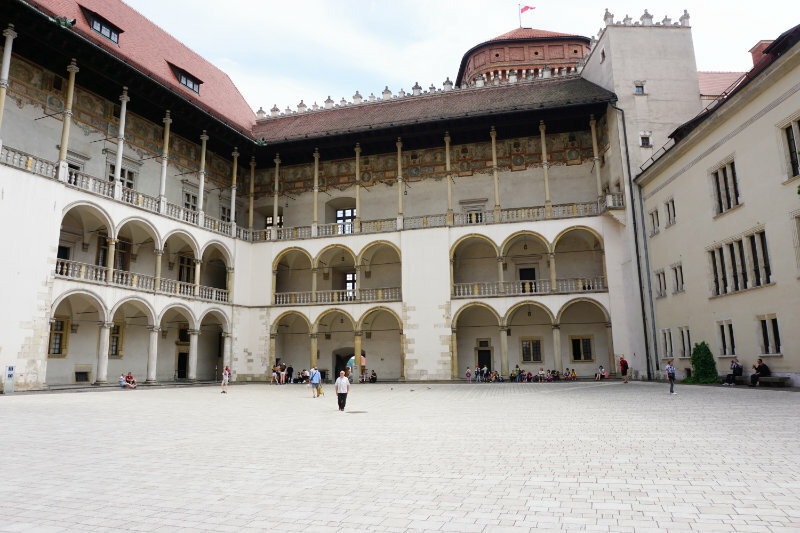 We noticed that it is not exactly easy to visit the Wawel spontaneously. Tickets can be bought on site but waiting times until the actual entry can be long. Tough luck when the day’s contingent is sold out – you have to stay outside. Tickets for the interior or the cathedral are by all means to be purchased in advance online. We limited our visit to the exterior, which can be explored for free, and enjoyed the nice weather. An arch leads to the arcade courtyard of the palace. Spacious and bathed in light; I liked the architecture of this courtyard. It must have been a pleasure for the castle’s inhabitants to wander around the arcades. Protected from the public but still able to get fresh air. The cathedral is part of the castle complex. If it weren’t for the golden roof, the tower and the windows, it could definitely pass as yet another winding extension of the castle. It was especially crowded around the cathedral. Many groups were waiting around to get into the church and for their tours through the museum, waiting times were long. A monument commemorating Pope John Paul II can be seen in front of the church. One of many – he was born and raised in a small town near Krakow. Even without a tour through the interior, we liked the Wawel quite a bit.